A. Zombie is on a roll, ladies and gentlemen! After a six-state campaign, including stops at both the Republican and Democratic National Conventions, the AMC-backed A. Zombie has officially been endorsed by Ed Anger of Weekly World News. 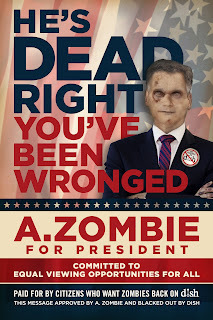 Why would anyone vote for A. Zombie? According to Ed Anger: "Those two political conventions gave me gas, constipation and the runs. It's time for a new kind of leader, it's time to elect somebody who already is dead. Not someone who acts dead. Vote A. Zombie!" Check out Ed's press release in it's entirety at Weekly World News. Have you lost your zombies? A. Zombie is here to help you get them back. According to his official press release, A. Zombie’s one and only mission is to rally zombie fans around the country who don’t have access to the AMC network to find an "alternative television provider before the highly-anticipated third season premiere on October 14, 2012 of A. Zombie’s favorite show, AMC’s The Walking Dead, the most watched basic cable scripted drama series among DISH subscribers, according to the Nielsen company." As A. Zombie says, "The average American family has a lot on its plate. But frankly, nothing good on its DISH." For more information see azombieforpresident.com and @AZombie2012 on Twitter.